Turkey´s new central bank governor Murat Cetinkaya speaks during a brief ceremony at which he officially took over from outgoing governor Erdem Basci in Ankara, Turkey, April 19, 2016. Under new leadership the Turkish Central Bank on Wednesday cut its overnight lending rate by 50 base points, following a 25-basis point cut last month, while leaving other key rates on hold. 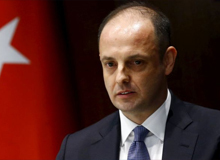 The one-week repo rate, which is the rate at which banks borrow from the Central Bank for one-week terms, was kept at 7.5 percent, the bank announced, in the first such move under its new governor, Murat Cetinkaya. The overnight lending rate, which is the rate at which banks borrow from the Central Bank overnight, was cut 50 base points to 10 percent. The overnight borrowing rate, however, under which banks lend or deposit money to the Central Bank, remained unchanged at 7.25 percent. "Recently, inflation showed a marked decline, mainly due to unprocessed food prices. This decline is expected to continue in the short run. However, improvement in the underlying core inflation trend remains limited, necessitating the maintenance of a tight liquidity stance," the statement said. The annual rate of inflation in Turkey fell to 7.46 percent in March from 8.78 in February due to a sharp drop in food prices, according to Turkish Statistical Institute data. However, the bank cautioned, "Future monetary policy decisions will be conditional on the inflation outlook. Taking into account inflation expectations, pricing behavior, and the course of other factors affecting inflation, the tight monetary policy stance will be maintained." Interest rates have been a topic of heated controversy between the government and the Central Bank since early 2014, when then-Prime Minister Recep Tayyip Erdogan, currently president, criticised the bank for keeping interest rates high. Government officials as well as Erdogan saw the high rates as a factor holding back economic growth, which needs to be over 4 percent in order to address rising unemployment. But under the helm of Governor Erdem Basci, who officially ended his five-year term yesterday, the CB refused to cut rates as fast as Erdogan and many government officials wanted, repeatedly linking further rate cuts to improvement in the inflation outlook.